Adriene is a professional at relocation. She is the daughter of an Army officer and has moved both nationally and internationally throughout her childhood although her roots are on Long Island since her father grew up in Oyster Bay and her mother on the south shore. Her husband's career also required many relocations including to Maryland, New Jersey, Illinois, Massachusetts and New York. She has moved her children from infancy to college. She knows that relocation, whether across town or across the country can be very stressful. Because of this experience, she is well qualified to help you find or sell your next house. She matches her clients' needs to properties using both her professional expertise and personal knowledge of the area. Her career as an Administrative Laboratory Director taught her great organizational skills. She remains intensely focused on service, integrity and discretion. Adriene lives in Huntington Bay with her husband and her British cream golden retrievers Jessie and Jovie. They have two grown children. She volunteers her time to fund raise for Family Service League. She is the current co-chair for the house tour committee which she has served on for many years. She was also a co-chair for the FSL Decorator's Tag Sale and a member of the FSL 85th Anniversary Gala committee. She is also active in her beach community. Adriene enjoys tennis, gardening, traveling and meeting new people. She is a graduate of the College of Mary Washington with a Bachelor's in Chemistry, Old Dominion University with a Master's in Clinical Chemistry and Central Michigan University with a Master's in Healthcare Administration. 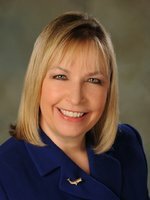 She is a member of the Long Island Board of Realtors and the National Board of Realtors. The source of the displayed data is either the property owner or public record provided by non-governmental third parties. It is believed to be reliable but not guaranteed. This information is provided exclusively for consumers' personal, non-commercial use.